There isn’t a day that goes by that I not offering a tip via email that aids in making your grooming regimen better. However, more often than not my explanations can be tough to grasp through email. So I decided to make my 1st illustration for ingrown hair sufferers. Aptly titled, Quick & Easy Steps for Smoother Looking Skin! Here’s the link for you to check out and or download, in my new Tips Store. 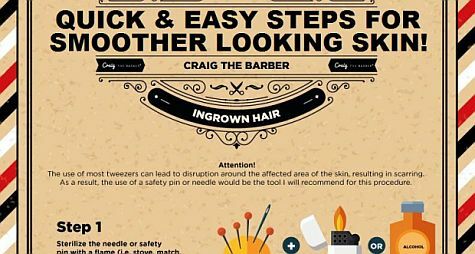 Sure, if you’re used to getting ingrown hairs you may have an idea! But, your way may or may not be preventing them from returning or reducing scarring, which can lead to the darkening of the affected area. So, take a look! The links to the store are in this article however, they can be found on the menu bar (on TheMensRoom.com) titled “Shop” or on my Facebook page with the “Shop Now” button. I am hard at work putting together a few more tip sheets together but, if you have any requests please feel free to share below in the comment section.